Announcement Welcome to my shop, a home of handmade modern and minimal fingerless gloves, mittens and wrist warmers and other crocheted accessories. Every item is hand-made by me and I usually can make a pair in 1 day so feel free to contact me for custom orders. 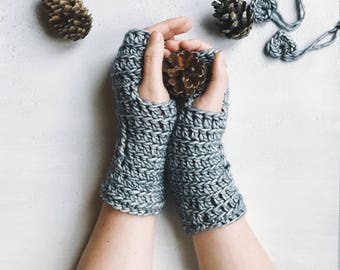 Welcome to my shop, a home of handmade modern and minimal fingerless gloves, mittens and wrist warmers and other crocheted accessories. 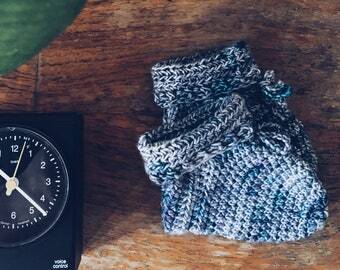 Beautifully made, gorgeous cosy gloves. The colour is beautiful, a hazy blue/ grey, arrived beautifully packaged with a thank you card - best thing I opened all year! Choosing the best, unique and luxurious yarns is something I enjoy thoroughly. Here, hand pained yarn from Paris. Working on packaging, all including the thank you cards is designed and put together my me. My name is Malgo and I’m a creative and maker living in Edinburgh with my little family. I started crocheting when I was pregnant with my daughter and never stopped really. After making accessories for friends and family I decided to open my Etsy shop to share my love for hand made creations with you. I love making beautiful crocheted fingerless gloves from the best yarns I can find, I never pass an opportunity to visit independent yarn shops to look for unique usually hand dyed yarns. My style is minimal and modern and I aim to make accessories that are timeless and will suit most outfits, so that you can enjoy them every day. I accept custom orders, contact me to chat anytime!